You may have seen this garden project all over the interwebs. I have always wanted to try it myself, and as the weather is warming up, my attention has turned to garden projects. This one has been on my list for quite a while. Cement is a messy endeavor, just check out my garden stepping stone video. It's also quite labor intensive. The crappy paper bags of cement are always leaking all over my trunk, making things dusty and gravelly. And they are pretty heavy to drag to and from the store and car let alone pour into a bucket or wheelbarrow. I am not saying I will stop making cement garden projects, but I was looking at using the smaller bucket of quick-set cement for this little project. I wanted to see if it worked better for smaller, more detailed shaped and molded projects. As it turned out, this quick-set cement does start firming up quickly, within 5-10 minutes, but is still workable. 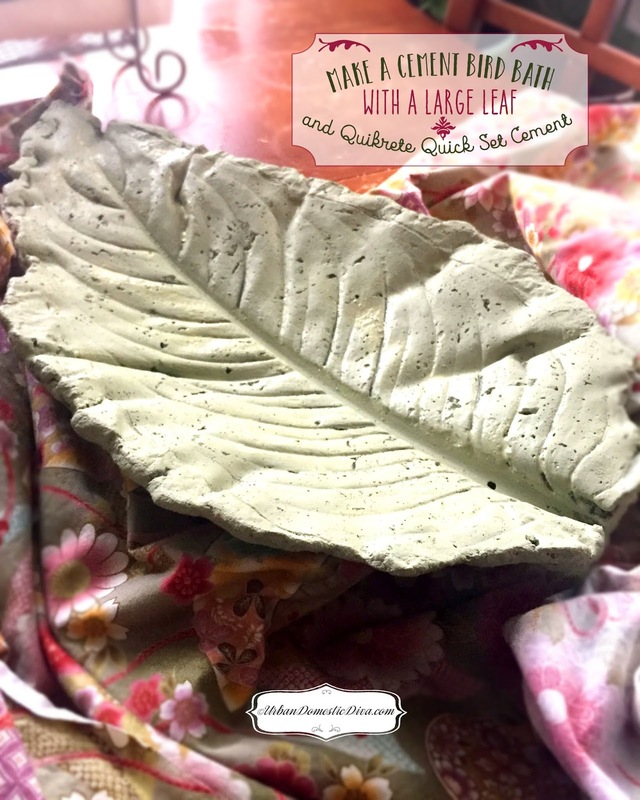 It acts almost like clay or play-dough at that point, which I was able to shape into a cylindrical base with my hands and plop onto the back of the birdbath, as well as work and shape the cement onto the back of my leaf mold. In my research, I discovered another product called Shapecrete, which takes the shaping and molding of cement's ability one step further. It seemed I could only get it online, so I couldn't try it for this project. But the quick-set worked wonders, and I only needed half of a 10 lb. bucket for this project, so I have enough saved for another project. I still waited for 20-24 hours to unmold it and paint it, and it does take about a month to FULLY cure, so keep that in mind when planning this project. I worked on it now so come garden planting time, my birdbath will be ready. There is something fulfilling about working with cement-as a woman, I guess. I grew up with my father being a cement mason and a contractor/business owner. I always equated cement with material that was too messy, too labor intensive and too hard to use for "meek women". So when I get my gloves on and mix cement, and make it work for ME, I feel pretty damn proud of myself. So you go get 'em, tiger. Make the cement work for you, too. It is pretty versatile, and its strength can work really hard for us in our gardens and yards. The sky is the limit for cement garden creations.